In honor of St. Patrick’s Day, I went through my 10-year archive of dolly pics and selected a variety of my girls in green. Some of these beauties have moved on, but most have stayed with me and continue to bring me joy. I hope they bring a smile to your face as you celebrate today with kisses to your loved ones and a nice frothy mug of green beer. My mother loved Rufus Rutter. He was her favorite doll, and she delighted in bringing him to the dental office where she worked. There she would place him in the reception area so he could great patients with his big, dopey grin. Some patients loved him. Others were freaked out by him. Rufus was a conversation opener–and mom loved to talk to just about anyone. Mom got her first glimpse of Rufus at his Tonner Con debut, where he joined his perpetual love, Ellowyne Wilde, as a table centerpiece. 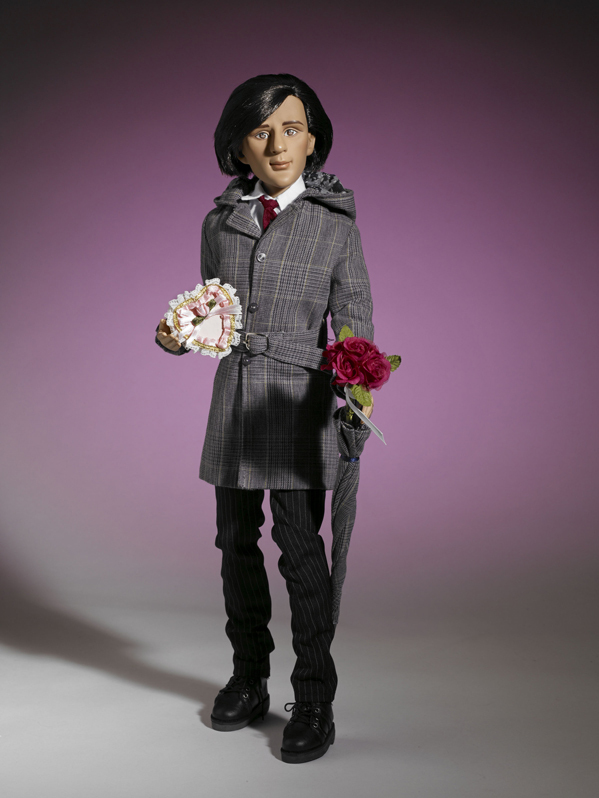 He wore a suit and plaid raincoat, clutching an umbrella in one hand and a heart-shaped box of chocolates in the other. Something about his getup and dopey grin appealed to mom, and she declared that she’d like to have him. 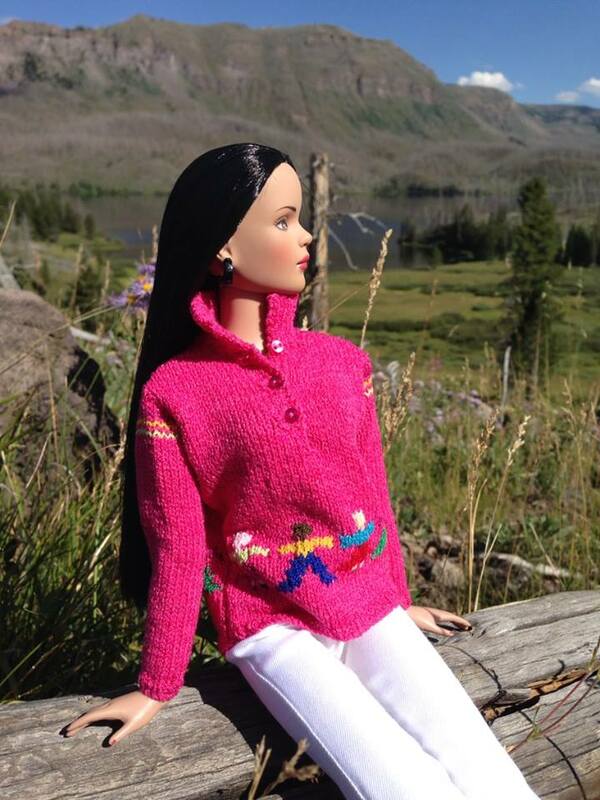 Now mom did not own–or want to own–an Ellowyne doll. She didn’t collect fashion dolls in general–child dolls most appealed to her. Rufus would be the oldest doll in her collection, and he would tower over her little girls. But she said that he made her laugh. Rufus would become the only doll in my mother’s collection that she actually played with. While the others stayed carefully arranged on curio shelves in static positions and wearing the same outfits year after year, Rufus sat on her dresser, where he sported a variety of casual and formal clothes. Rufus had a claim on my mother’s heart that no other doll ever had. When I inherited mom’s collection, I took Rufus from her house first. He currently stands shoulder-to-shoulder with Prudence, who, in my world, is a lesbian and has become Rufus’s best friend. When I was brainstorming an article idea for the latest issue of FDQ, Rufus’s dopey grin caught my eye, and I was struck by a vision of him between his handyman jobs–dressed in jeans and a plaid shirt–lying in his basement apartment and dreaming, as always, of Ellowyne Wilde. The resulting article, “Rufus’s Daydream,” appears in the Autumn 2015 edition of FDQ, now shipping to subscribers. Below is a teaser. To find out how the story ends, paper and digital issues are available at FDQ’s web site. My very talented friend, Angela Nielsen, provided the story’s photos. He spent a lot of time lying on the small cot that was his bed, wondering what she was doing in her apartment four stories above. His own apartment—much smaller than hers, of course—was in the basement of the grand Victorian home that once belonged to her grandmother. His space was modest, as was he, but he didn’t have many wants or needs—at least of the material sort. As the house’s resident handyman, it was also his workplace. And he didn’t venture out much— except at the insistence of Prudence, who never tired of telling him that he was growing paler by the day and needed to get out into the sunlight. Prudence was her best friend, and his good friend as well. Prudence was also his handiest excuse to get closer to her. After all, she too did not venture out much, generally preferring to envelop herself in her pensive moods and linger over the trinkets and ephemera with which she surrounded herself in the spacious rooms she inhabited. In the handful of times he had been in her apartment, he was mesmerized at the number of antique clocks, vintage outfits on dress forms, porcelain ladies, and dried flowers that occupied every corner of her rooms.